Throughout his 20-plus career, artist Tom Huck’s often brash sociopolitical commentary has drawn from great satirical artists like Hogarth and Daumier. His technique, on the other hand, is inspired by the famed German woodcut artists of the Northern Renaissance, including Albrecht Durer and Martin Schongauer. 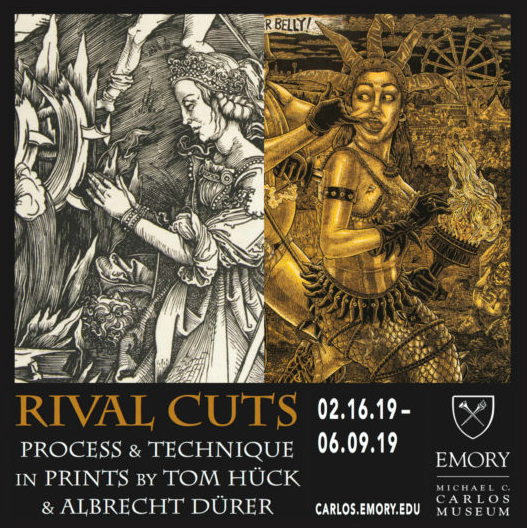 Rival Cuts: Process and Technique in Prints by Tom Huck and Albrecht Durer, on view at the Michael C. Carlos Museum of Emory University from February 16-June 9, 2019, brings a selection of Huck’s woodcuts together with works by Durer, his printmaking hero. 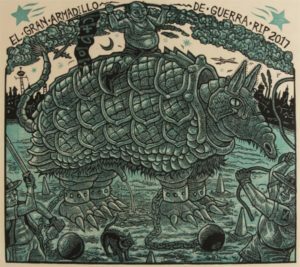 In conjunction with this exhibition, Tom Huck will be in residence February 16-24, thanks to the Donna and Marvin Schwartz Center Artist-in-Residency program and the Andrew W. Mellon Foundation.